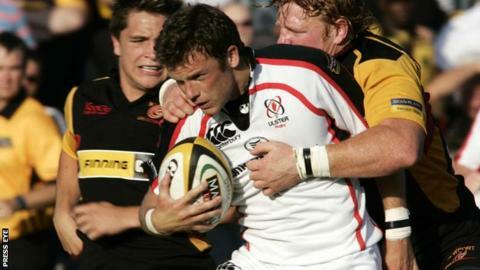 Former Ulster full-back Bryn Cunningham has been appointed as the Irish province's new team manager. The team manager role is a new position and has been created following a review of the structures at Ulster. Cunningham's duties will include recruiting and retaining players, identifying talent and conducting contract negotiations. The manager, who played over 150 Ulster games, will also oversee the management of team operations on match nights. Ulster chief executive Shane Logan said said that Cunningham's playing background and subsequent expertise in the area of sports management gave him a "unique skill set". "Bryn was the stand-out candidate from applicants from across the UK and Ireland," said the Ulster chief. "He possesses an extensive knowledge of the domestic and international player market and a first-hand understanding of what is required to develop a positive team environment." Cunningham, 36, has worked with a sports management agency since his retirement from rugby in October 2010 and many of his clients were rugby stars. "With it being a large part of my life, I know the place intimately and have clear goals over the next three years in helping to take the province to the top of the European table. "I leave Esportif International and the agency world, which, for over four years, has given me an invaluable insight and the necessary experience to take on the challenges that lie ahead." Cunningham will start his Ulster role on 10 November. Ulster's hierarchy will hope that Cunningham's appointment further stabilises the province following a summer of upheaval at Kingspan Stadium. David Humphreys shocked his Ulster bosses in early June by leaving his director of rugby role to take up a similar position at Gloucester. Coach Mark Anscombe was sacked some three weeks later which led to Ireland assistant coach Les Kiss being drafted in as interim director of rugby at Ulster for a period. Earlier this month, Anscombe's assistant Neil Doak was appointed Ulster coach while it was also announced that Kiss, who is now back with Ireland, will become the province's full-time director of rugby after next year's World Cup.